NOTES: Short run kit with resin detail parts. Flightpath etched set and Max Decals used. For the Irish Air Corps, the requirement for a modern turbo-jet aircraft was not forthcoming until 1954 as a direct result of attrition to their fleet of aging Seafire Mk III’s. In order to fulfill this requirement, the Department of Defense ordered three Vampire T 55 series aircraft from De Havilland Aircraft Company. Starting in the spring of 1950 the De Havilland Aircraft Company began design of a new advanced trainer aircraft based to the Vampire NF 10 airframe. This private venture resulted in a prototype (DH 115A) being created that was a conglomerate of existing airframe components: the wide fuselage of the NF 10 joined with the strengthened wings, tail booms and tailplane of the Vampire FB 5. With the successful conclusion of testing, the new trainer was designated the T 11 series and production commenced in the late summer of 1951. The first production T 11 version flew in January of 1952, with a total of 731 airframes being produced by DH and Fairey Aviation for the RAF. An additional 73 aircraft were completed as Vampire T 22’s for the Fleet Air Arm. A further 216 aircraft designated T 55 were produced for export and were delivered to 20 different countries worldwide as well as being license built in Austria, India and Switzerland. The Irish T.55’s were delivered in the summer of 1956 and represented a huge step forward for the IAC. Not only were the Vampires the first jet powered aircraft to enter service with the IAC they were also the first to be equipped with ejection seats. The first formal showing of the Irish Vampires occurred on Easter Sunday, 1957 with a fly-past over the annual Defense Forces parade in Dublin and they quickly entered service with No 1 fighter squadron. By 1960, the IAC was in need of a replacement for their worn-out Spitfire Tr. 9’s. Additionally, the existing Vampires could not meet all of the advanced training requirements as well as fulfilling the operational requirements of No 1 fighter squadron. As such the Department of Defense ordered a further three aircraft. The six IAC Vampires provided air support, ceremonial escorts, and training until 1975 when due to parts scarcity they were retired in favor of the Aerospatiale Super Magister. It always fascinates me how models ‘choose’ me to be built. 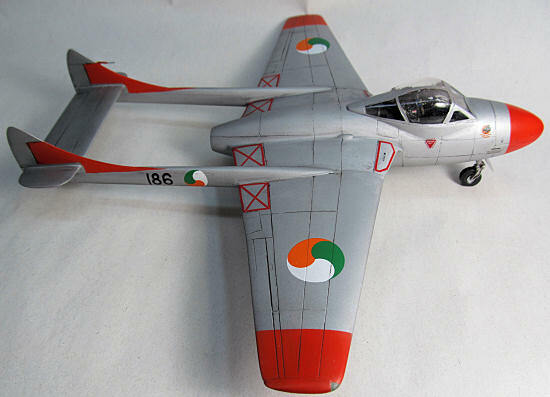 Prior to my decision to build only Irish aircraft for 2012, I would never have even considered building a model of a DH Vampire of any sort. Not that there is anything wrong with the plane or models of it; the Vampire family just didn’t inspire me. However, this particular aircraft represents a pivotal transition for the IAC into the realm of ‘modern’ airpower; and, I had decals for an IAC T 55, so a search ensued to find a kit. The T 11/T 22 boxing from Classic Airframes (CA) appeared sometime around the mid 1990’s. Additionally, CA has since gone out of business. As such many of their kits are not only hard to obtain, but command significantly higher prices than the kits retailed for originally. For this build, I was able to find a kit from another modeler on one of the numerous on line trade forums at a very reasonable price. Additionally, after some discussion with modelers on the IPMS Ireland web site I decided to purchase the somewhat pricey Flightpath etched set to correct and supplement the kit offerings in regards to the aircraft flown by the IAC. There are numerous reviews of the various CA Vampire marks out there; however, since it has been a while since most were published I will walk you through my impressions of what you get in the box. First up-the actual box that the kit comes in. Classic Airframes was nothing if not consistent with the use of their boxes. I have never found CA boxes to be particularly sturdy, and they seldom seem to stay together for an entire build-which in some cases can be quite lengthy due to the frustration factor of their limited run nature. However, the box art is always fantastic and representative. Once open, the box contains two light grey injection molded sprues that make up the bulk of the airframe, one very clear and distortion free injection molded canopy and a plastic bag containing 20 beautifully cast resin parts. First impressions are important, and for this kit everything was thumbs up. There was very little flash present, and although a limited run kit the progress of the CA mold makers can be seem in the relatively modest attachment points on the plastic sprues. Overall the panel lines were consistent and amazingly petite. The resin parts were all intact, and although there are significant pour blocks to be removed they did not seem poorly placed or awkward to remove. One disappointment revolved around the canopy. Although very well cast, it is one piece; not allowing the modeler to easily pose it in the open position. The instruction sheet is one folded sheet and printed in a style consistent with previous CA kits-clear parts placement without any hints for assembly. Decals are printed by Microscale and include three markings as well as a separate sheet with stencil data. The Flightpath detail set struck me as simply overwhelming. Wow, what a bunch of brass! The instructions are clear and well diagramed, but the sheer number of parts contained here is, well, boggling. I want to preface the construction process with the caveat that I am in no way a Vampire expert. Also, because this was a whim build for my Irish theme, I did not have any real, in depth resource materials to consult during construction-just a few images of IAC Vampires and the ol’ Mk I eyeball quality control (EQC) system. The CA vampire is a limited run kit. This means that there are some expectations put on the modeler for construction such as no alignment pins for the wings and fuselage components and it is expected that parts and subassemblies must be dry fit a few times before being committed with glue. Some limited run kits are easier than other in regards to construction. 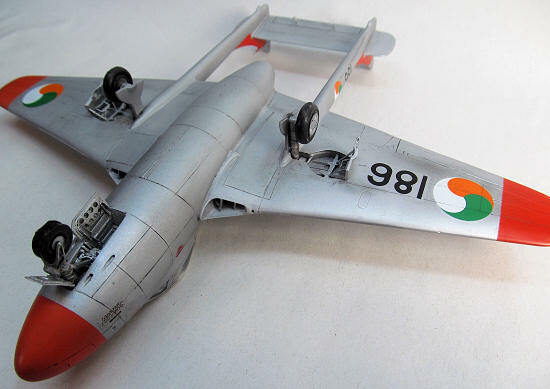 In the case of the CA T 11/T 22 Vampire, I can say that construction was pretty much a breeze with no real hang ups that were not of my own making. Assembly started with a soapy bath for the resin parts. While the cockpit parts dried I began assembling the tail booms and wing assemblies. Clearly CA has learned from their previous kits as the wheel well inserts fit with little trouble. The wings could benefit from having the trailing edges thinned some, but look okay without the extra effort. Fit of the wings was great and there was no apparent warpage with either the wing or boom parts. The resin intake assemblies fit with no fuss, although careful trimming is required to get a good fit and placement at the fuselage edge of the wing. I painted all of the cockpit components and fuselage interior with Floquil Engine Black. Using dark grey and burnt umber pastels I highlighted details and glued the resin side panels into the fuselage halves. The ejection seats uncharacteristically have wonderful seatbelts cast in and needed only careful painting to produce wonderful representations. At this time I installed the cockpit tub, instrument panel and the rear engine backing plate (without tail pipe) into the left fuselage half. Never before have CA items fit without trimming, but this cockpit fit as advertised. I unfortunately did not have the Flightpath brass set at this time, and rather than lose momentum, decided to press on with construction. CA chose to mold the nose section separate from the fuselage, in two halves. Because of previous experience, I chose to carefully attach these to their respective fuselage half prior to mating the halves together to alleviate fit problems. I also added a considerable amount of lead fishing weights at this time (considerable meaning I have no idea of the actual weight because I don’t own a small scale to check with). I glued the fusela ge together with both super glue and Tenex, depending on the perceived ‘load’ for the seam. Once things securely joined together there are two lower panels that must be fit to the fuselage. The first contains the nose wheel bay, and after drilling out the cannon holes it was secured with very little alteration. Unfortunately, the rear most belly panel did not fit well at all, requiring considerable patience to get it nice, and filling to get it smooth. At this point I promptly dropped the fuselage pod onto my concrete shop floor. Overall the fit of the wings to the fuselage pod was not too bad. However, they didn’t fit great either. Because of the resin intake assembly right at the wing root, some fussy trimming and fitting was required to get a snug fit at the wing root. Although an okay fit was eventually achieved, a sizable amount of difficult to recreate detail was lost all along the upper and lower seams of each wing attachment. Care must also be taken to ensure that the wings are level and appear square to the fuselage pod-not an easy task as the pod is very round and the wings tapper. I used a ruler and small carpenters square to help get things aligned. Prior to attaching the wings I also cut the wing tip lights and made clear representations from an old toothbrush handle. The tail booms attach quite securely; however, it is paramount that they are also ‘true’ on multiple planes. For the tail plane, I drilled small holes and used wire for a secure attachment. At the point where I was ready to begin applying glue I gave each attachment point a small amount of Tenex to soften the plastic and get things sticking, and also allow time to wiggle everything into place. I used the small carpenters square to ensure that the vertical and horizontal tails were in fact at 90 degrees to each other and again I used the ruler to ensure that the booms were true to the attachment points at the wing using the center seam as a reference line. With everything properly lined up I gave all the joints a thorough application of Tenex and set things aside to dry for a day or two. Whew! For final assembly before paint I detailed the wheel wells with some of the Flightpath parts. Unfortunately, the brass sheet is fairly thick and the attachment ‘stubs’ are also quite thick requiring a solid cutting surface so as not to distort the sometime small detail parts during removal. I originally intended to pose the model with the cockpit canopy open. In order to facilitate opening the canopy I intended to make my own vacuformed canopy, cut it apart and use the Flightpath canopy framing to really detail things out. Unfortunately, I realized that there was no way I was going to successfully get the framing cut out without damage, so I opted to dip the kit canopy in Future, mask it up and install what was provided. Thankfully it fit very well. I also used the brass set to modify the main wheels to something more closely approximating what the IAC aircraft used as well as other brass bits on the landing gear legs and doors. Finally, after installing a few more fiddly bits on the airframe and a final sanding with 400 grit sandpaper it was time for paint. Because De Havilland made considerable use of wood in their construction of the Vampire, the aircraft were painted silver rather than being in natural metal. 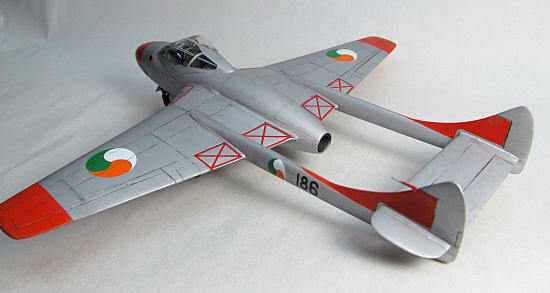 The IAC Vampires also had tricky orange panels painted on the tail, wingtips and nose. I started painting with a coat of Model Master flat white in all of the areas that were to be painted orange, followed but a few light (to coverage) coats of MM International Orange FS 12197 (#2022). After a few days drying time I masked off the orange. 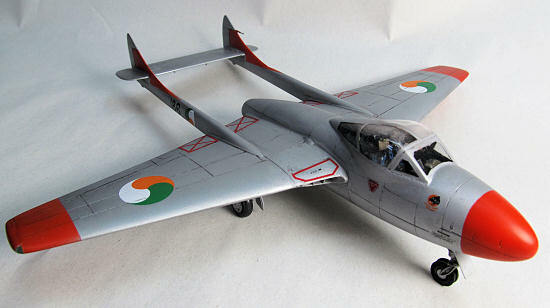 I chose to paint in this color order because of the difficulty in masking the orange on the tail over the silver. Once everything was covered I sprayed the entire airframe with Floquil Old Silver and top coated with MM Glosscoat from a rattle can. Decals are from the Max Decals sheet 4821 Irish Air Corps, 1922-1956. They performed perfectly, although use care and lots of water as you initially position the decals as they tend to stick hard as they are first placed. All of the trailing edge/flap area warning markings were individually placed using narrow red line decals. Some, but not all of the kit stencils were placed and the model was given a top coat of MM Dullcoat. Slight weathering was done with pastels and artists acrylics to accentuate panel lines and wear. I found the CA Vampire to be a fun and rewarding build. I have read that there are faults with the kit, but overall I felt that it was a straight forward build that gave me very little trouble-a blessing given some of my experiences with CA kits. Upon completion of the model I posted some images on the IPMS Ireland site to share, and created some interesting discussion. Clearly one of the real faults with the CA kit are the fictitious panel lines. As I stated at the start I am not a Vampire expert, nor am I a rivet counter. That said, the Mk I EQC system did let me down, as pictures of the real plane clearly show that many of the panel lines on the fuselage pod are wrong-oh my! Well, I probably could have fixed those panel lines had I caught the error; but, done is done and it passes my criteria test-it looks like what it is supposed to look like (funny panel lines and all). Maybe not a contest winner; but, it is finished and on the shelf and I learned a few new things along the way. If you can find one, this is one of the very best CA kits I have built, and well within reach of modelers of average skills.